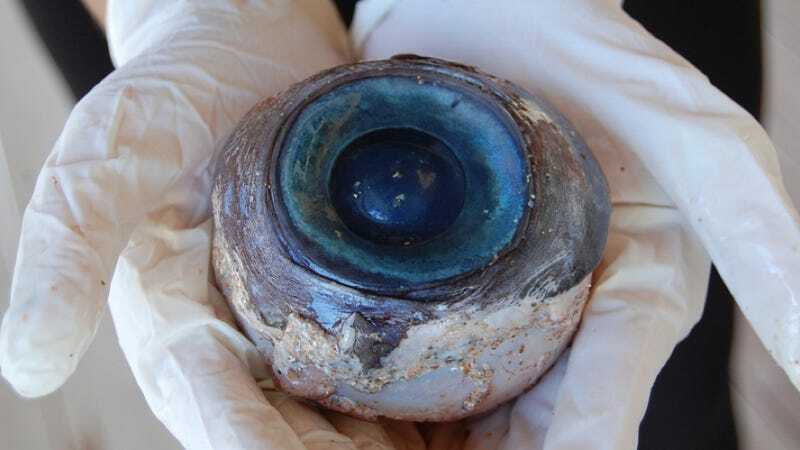 Last week, a softball-sized eyeball washed ashore in Florida. At the time, researcher Charles Messing guessed the eye belonged to a swordfish. A day later, Deep Sea News' Craig McClain got in touch with Sönke Johnsen, "an expert on everything visual in marine organisms" (awesome, right?). Johnsen told McClain the fleshy orb was "definitely a swordfish eye." And today, researchers at the Florida Fish and Wildlife Conservation Commission released their official verdict. Survey says? Swordfish eye. "Experts on site and remotely have viewed and analyzed the eye, and based on its color, size and structure, along with the presence of bone around it, we believe the eye came from a swordfish," said the FWC's Joan Herrera in a statement. "Based on straight-line cuts visible around the eye, we believe it was removed by a fisherman and discarded."